This was the product that got it all started for us back in 1974, and to this day it's STILL the only fifth string capo worth putting on a banjo. It operates on a lever principle, not a spring, so it provides sufficient pressure to fret the string without muting the tone. It slides on a slim, dovetailed bar which mounts flush to the neck, making it sturdy and unobtrusive. 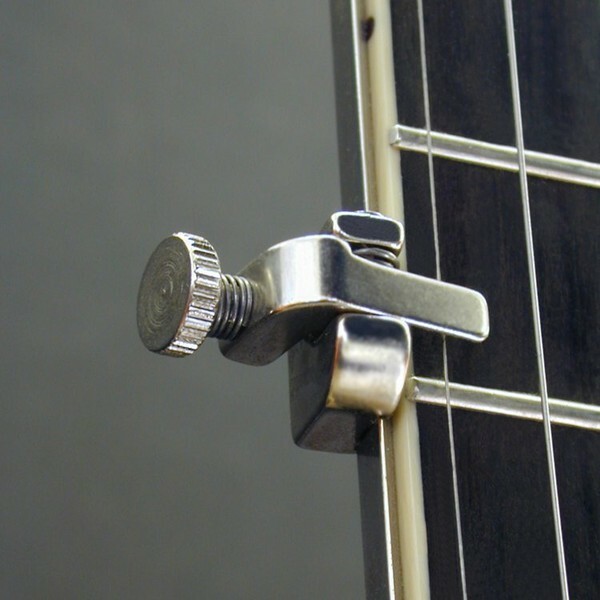 Originally, our fifth string capo bar was eight inches long, and attached to the banjo neck with three mounting screws. A few years ago we remodeled the bar, a change which I'd long considered. I personally never capo the fifth string any higher than the tenth fret (this would go along with the regular capo being at the fifth fret). So for my own banjo, I made a custom bar which was much shorter (5.75"). This shorter bar is now our standard size. Besides taking up less space on the neck (for you fellow thumb-wrappers), it offers the additional advantage of using only TWO mounting screws instead of three. If you feel that you want to be able to capo all the way up to the thirteenth fret, the original eight inch, three-screw bar is still available. The price is the same.